You may not necessarily pick it but there is an outdoor sanctuary for children in the heart of Sydney’s CBD. Darling View – Market Street Early Learning Centre has a coveted outdoor area where children can learn and explore in alongside our dedicated educators. Angelique notes the space also provides an opportunity for the children to enjoy meals al fresco style (which is a luxury compared to the desk lunches those of us with office jobs know all too well). You’ve probably heard of The Breakfast Club, but have you heard of Garden Club? At Darling View, the team are building a culture of sustainability amongst the educators, children and their families and have added Garden Club to one of their regular activities. Having come about from educator and family collaborations, Garden Club meets once a week and encourages the children, families and educators to participate in growing herbs, flowers and vegetables. The produce from our Garden Club is harvested by the children, and given to the cook or our families, who use it in their cooking. 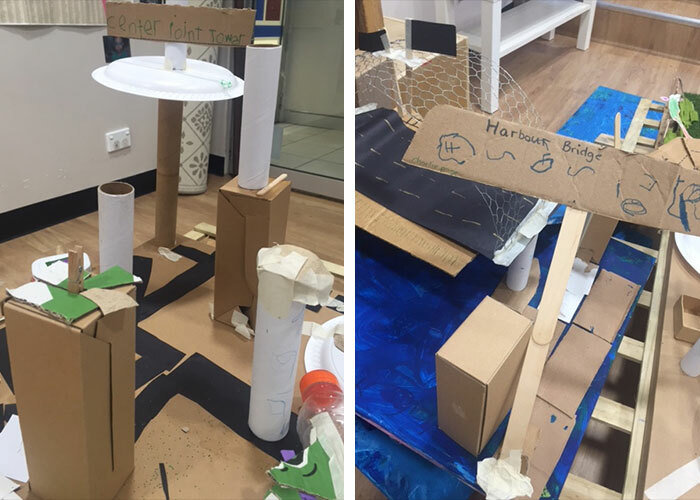 Darling View – Market Street Early Learning Centre’s Recycled City project. Valuing sustainable practices, Darling View offers children the opportunity to engage with recyclable materials. Recently the Early Learners created a replica of Sydney City using only recycled and sustainable materials. Their project included the Sydney Harbour Bridge, Sydney Opera House, the Botanical Gardens as well as a number of iconic sites in the area. The sustainability project garnered the attention of the City of Sydney council who featured the Recycled City commending it for outstanding use of recycled and sustainable materials in an early learning setting. This child care centre in the middle of the CBD provides children with both indoor and outdoor spaces specially designed to stimulate their growing minds and bodies. Children are also taken on regular excursions which connect them to the community around them and they enjoy seasonal home-style meals prepared for them by the centre’s on-site cook. To find out more about this early childhood education and care centre and to book yourself in for a tour, head here.